His preferred medium is oil, but he also works in watercolour and acrylic. 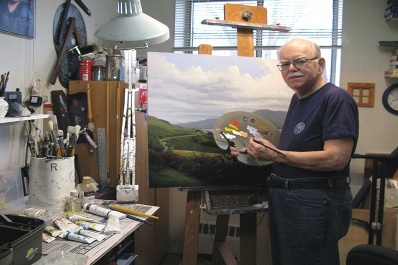 In 1998, he wrote the best seller Color Secrets for Glowing Oil Paintings, published by North Light publications. In 2016 Nita Leland included his work in the Thirtieth Anniversary Edition of her best-selling book. Exploring Colour published by F&W Publications. His work has appeared in International Artist Magazine and numerous other publications. He is an elected member of The Society of Canadian Artists (SCA), The Ontario Society of Artists OSA. He has been an professional member of the Arts & Letters Club of Toronto since 1993. His solo exhibition: The Legend of Landscape was held at the club in 2007. He currently is a member of the club's Curatorial Committee. Since 1997 he has been a member of Winsor & Newton's Fine Art Collective, (FAC), as a member he visits Universities and Colleges in Ontario demonstrating and talking about the proper use of artist's material and introducing new materials and concepts. He has taught painting each summer at Loyalist Colleges Summer Arts program since 1998. In 2005, Doug won the Museum Purchase Award at the 26th Annual Mystic Seaport Annual Marine Painting Exhibition. In 2012 his illustration for Liquitex Acrylic Inks was included in The Society of Illustrators, Los Angeles, Ilustration West. He was profiled in the autumn 2013 issue of Magzin-ART. His popular painting workshops ar given for art clubs and art societies. He is represented by Quinn's of Tweed and Westmount Gallery in Toronto, Ontario. His paintings are in the permanent collections of Mystic Seaport, Scottish National Tourist Board, Toronto Public Library, City of Toronto, Card Lake Resources and Co-operators Insurance of Canada and The Arts and Letters Club of Toronto.